Newline is a Danish company, which develops and produces sports wear for running and biking. The company started off in 1981 and is today a very strong brand in functional sports wear. JAOO IT-Run is sponsored by Newline. Software Engineers, Project Managers - a lot of us - do not exercise enough. JAOO would like to make a difference and therefore we are organizing the JAOO IT-Run for the eighth time in a row. Whether you are a regular runner or have to start from scratch we hope that a lot of conference participants will take the challenge and join the run. 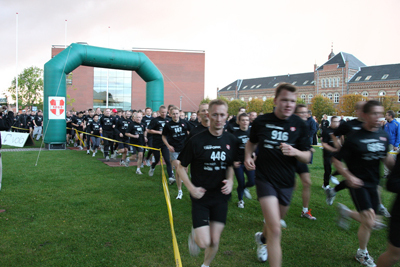 The JAOO Run is organized by Trifork, Aarhus 1900, and Newline. Aarhus 1900 is one of the biggest sport clubs in Denmark and is each year the organizer of numerous different sporting events in Aarhus. 16,- EUR (120,- DKK) per person. 43,- EUR (320,- DKK) teams of three persons. This includes a Newline T-Shirt, a refreshment and a light meal. If you attend JAOO the JAOO IT-Run registration is free of charge, please register when registering for the conference. In the "Ridehuset" from 17.00. 18,- EUR (140,- DKK) per person. 45,- EUR (340,- DKK) teams of three persons. You can run either individually or in teams of three runners. The JAOO IT-Run takes place October 6, 2009. You will receive a Newline t-shirt to wear on the IT-Run. T-shirts can be picked up in Ridehuset on the day of the run from 17:00.